Test your skills to the max with the Complete Skate Park which includes x2 quarter pipes, x1 Skate Bench, x2 Grind Rails, x2 Sky Ramps, and the versatile Port-A-Park (x2 Wedge Ramps, x1 Street Box and x1 4ft. Grind Rail). Your possibilities are endless for perfecting your Skateboard, BMX Bike, Extreme Scooter, Snowboard, Inline Skate trick skills. 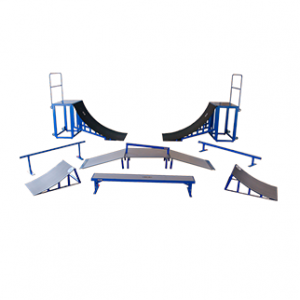 With a heavy steel frame construction and durable polyethylene ramp surfaces, this Complete Skate Park will be able to withstand your best and your worst, PLUS all your friends! Test your skills the way YOU want, where YOU want, at the level YOU are at. 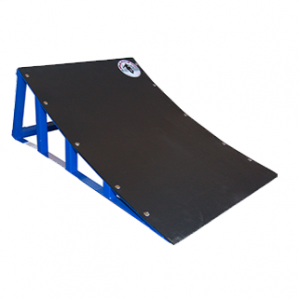 The Blue Sky Ramp coming in at 45in x 30in x 15 in is perfect for perfecting your Skateboard, BMX Bike, Extreme Scooter, Snowboard, Inline Skate trick skills. With a heavy steel frame construction and durable polyethylene ramp surface, this Sky Ramp will be able to withstand your best and your worst! Weighing in at only 35lbs you have the ability to test your skills the way YOU want, where YOU want, at the level YOU are at. 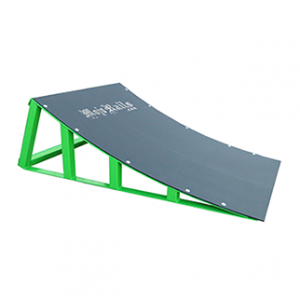 The Green Sky Ramp coming in at 45in x 30in x 15 in is perfect for perfecting your Skateboard, BMX Bike, Extreme Scooter, Snowboard, Inline Skate trick skills. With a heavy steel frame construction and durable polyethylene ramp surface, this Sky Ramp will be able to withstand your best and your worst! Weighing in at only 35lbs you have the ability to test your skills the way YOU want, where YOU want, at the level YOU are at.